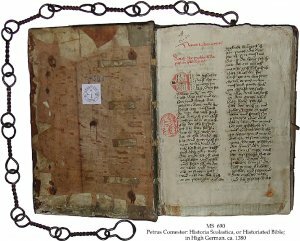 Description	 MS in Middle high German on paper, Monastery Zwettl, Waldviertel, Austria, ca. 1380, 325 ff. (-2), 30x21 cm, 2 columns, (20-21x14-15 cm), 29-33 lines in a current Austrian lettre bâtarde, by 3 scribes, headings in red, several hundred 2-to 3-line initials in red throughout, 1 4-line red initial with brown infill. Binding	 Monastery Zwettl, Waldviertel, Austria, ca. 1400, leather over stout beech boards, sewn on 4 thongs, with a chain of twisted iron loops and a ring, 90 cm, fastened at the top of lower cover. As marker between the various chapters are sewn in vellum strips, ca. 1 cm wide, extending outside the foreedge, taken from 2 Austrian documents from 14th c., one from the church in Steinkirch. 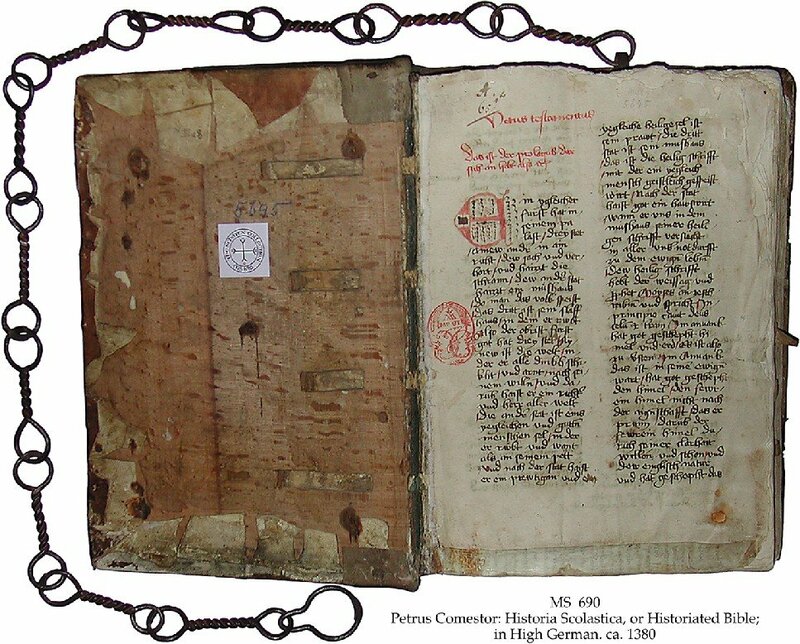 Context: From the same scriptorium, with the same provenance, and in the same type of chained binding as MS 691. Provenance	 1. Benedictine Monastery Zwettl, Waldviertel, Austria (ca. 1380-17th c.); 2. Johann Jamaigne, Alt-Pöllach, Waldviertel, Austria (17th c.); 3. Piaristen-Kloster, Wien (18th c.); 4. Graf Wilczek, Schloss Kreuzenstein, Austria, No. 5645 (from 19th c.); 5. Gilhofer & Ranschburg, Wien (1989-1990); 6. H. Tenschert cat. 22(1990):18. Commentary	 Of the 101 known "Historienbibeln" in German, this is the earliest and the only one from 14th c.